In my ceaseless quest to provoke any Tea Partier into proving that racism isn’t the only thing that gets them out of the bed in the morning, I’ve tried to get those tax-o-phobic folks to explain why they won’t go after the local bodies responsible for taking the biggest bite out of their bank account. But you’ve never seen a Tea Partier protest a school board meeting, now have you?. Then I asked that conservative crowd to describe just why they gave the previous Metra Board a pass. Because if big government corruption is the real problem, then it doesn’t get much bigger than that. But you’ve never seen a Tea Partier sitting in on a Metra meeting. Not one to take stunned silence for an answer, then I challenged the Tea Party to take on the scourge of corporate welfare. That $100 billion in government largesse utterly dwarfs the paltry $60 billion taxpayers contribute to social welfare programs. But I’m still waiting for the Tea Party to make the first move. Since I certainly appear to be a glutton for punishment, I’m gonna make one more attempt to get my favorite reactionary rightwing folk to explain yet another vast inconsistency that dominates their philosophical ranks. Because when you consider that the Tea Party movement was largely fueled by the rise of militia groups who continue to rail against the black helicopters of the impending One World Government, one has to wonder how they’ve completely missed the militarization of the American police. Thankfully, those sinister choppers are only a figment of some rather fertile imaginations, but as Ferguson, Missouri has clearly shown, local police forces acting as an occupying army are far from fiction. Not only has the Tea Party been silent on this most clear and present threat to our personal freedoms, but they’re actually applauding this use of force. Of course, the fact that two-thirds of Ferguson’s residents are black might have something to do with their unyielding police support. And a great deal of that equipment is going to small town police forces like West Lafayette, Indiana where violent crime is virtually non-existent. But that didn’t stop ‘em from picking up their very own MRAP! The real problem is, any time you provide any group with these kinds of “toys,” it creates an inherent propensity to want to use them. According to the Wall Street Journal, there were just 3,000 nationwide SWAT raids in 1980. By 2005, there were over 50,000 of them. In 2010, the New Haven, Connecticut police sent their SWAT team to raid a bar in answer to an underage drinking tip. A Baltimore SWAT team raided a VFW poker game. But the best one has gotta be this! A bunch of Iowa SWAT boys, in full regalia, were dispatched to apprehend a group of Tibetan monks who’d overstayed their visas. This is not an indictment of the average police department as much as it is of the idiots who would freely provide this kind of equipment. Great police chiefs like Elgin, Illinois’ Jeff Swoboda have repeatedly declared their aversion to being perceived as an occupying force, but as it is with any profession, the lousy and mediocre always outnumber the cream of the crop. While you can certainly change doctors if you’re unhappy with your current treatment, it ain’t quite as easy to change police departments. Ah! But if anyone could make that kind of impact, it’s those overly vociferous folks of the Tea Party ilk. But while they will regularly accuse the IRS and President of harboring tyrannical tendencies, at a time when our precious personal freedoms really are teetering on the brink of a steep precipice, the silence is suddenly deafening. What tea partiers will be all too happy to tell you is that their dissatisfaction and perpetual discontent with the state of this country has nothing to do with the fact the President is black. While I have serious concerns about a Militarized police force, our local elected officials & the public seem to broadly support SWAT style police equipment & training. When I raised the issue of Elgin’s purchase of our armored troop transport (complete with gun turrets), the reply at the time was that it is to protect people and is not an offensive weapon, The assumption is that SWAT will only be used against the bad guys and for hostage situations. No one took my objection seriously. I wasn’t the only one who reached out, but we were a small minority opinion. As we see in Ferguson, the local police (among other things) put a man with a MACHINE GUN on top of an armored vehicle to stop local residents from walking the streets. Why? Did they feel the protestors needed to be shot down en masse if they got too close? Did they feel they just needed to scare them? Did they feel that threatened by unarmed civilians? Do you think the residents of Ferguson really wanted that? 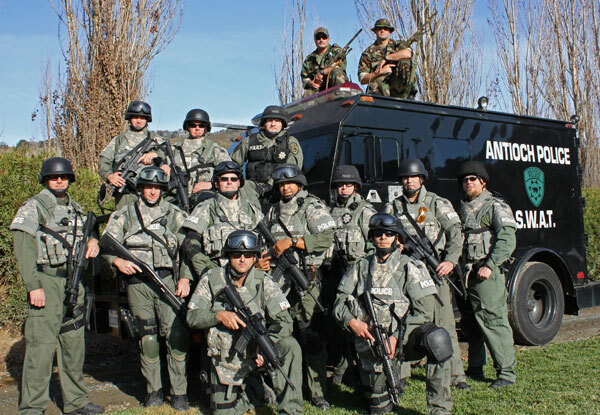 Jeff, your SWAT photo for Antioch (population 14000) shows 14 SWAT officers with M16 assault rifles (30 round clips). How many SWAT officers do they need to address a hostage situation? Why do they need to wear camouflage? If they need a sniper, why not a bolt action rifle. Why 14 snipers instead of 1 or 2? The Posse Comitatus Act was passed to keep us from Army occupation. If the Police are given Army equipment, how are they any different? We do have great Police Chief. Chief Swoboda runs a great police force. Our crime rate is low and we have few complaints. However, it is not perfect. Our Elgin police force shares some of the same problems which plague Ferguson. We have officers who mostly live outside the City. Our police officers (especially the higher ranks) are much less diverse than our community. We don’t have much in the way of foot patrols or bike patrols (community policing), they mostly work out of cars (and lately it seems tending toward BIG SUV’s). Selective “targeted” enforcement to drive out the “bad apples” carries risks of discrimination and injustice. Some of these issues are being worked on (they’re lowering the entrance requirements) and some are not. There are community relations risks which must be managed every day. It is easy for people to think Ferguson is fundamentally different than us. That our police officers are fundamentally better. That Elgin residents would never take to the streets and get stirred up enough to riot. And if they did, we need SWAT to tear gas Elginites because only the “bad guys” would be out on the street after “curfew”. I don’t think that way. We’re not any better human beings. Unless what is “Normal” for local police changes, we’re rolling the dice each time something happens. In my view, tear gas should never be used for crowd control. Machine guns have no place in local police enforcement. Police should be engaged with the community, not garbed up like a Marine.